Living close to her family was the main reason Kirsten Tejada started looking for a home in Locks Heath - but being able to buy a Bovis Home at the Hampshire location has proved to be a fabulous and unexpected new-build bonus. "My parents live in the area and I've lived here all my life," she says. "I didn't want to move too far away. My husband Daniel and I have only been married for a year and we had been trying to find somewhere for ages. We looked at all sorts of houses and couldn't find the right thing." Then a local estate agent pointed them in the direction of Bovis Homes' Gallons Way location so they decided to take a look - and they haven't looked back since. "We weren't particularly looking for a new-build but we really like the development," she says. "It's quite out of the way; it's really quiet, and we love the area." They chose The Arnold, a two-bedroom coach house with a south-facing garden. "We bought really early on," says Kirsten. "I think we were the first or second to buy a house on the development. It's a coach house: it's all open-plan and it's got a garden as well - that's what really swung it for me." Buying a new Bovis Home gave the couple opportunities they wouldn't have had if they'd bought an older property, and they thoroughly enjoyed the experience of choosing different features of their new home, which were all included in the price. "We couldn't physically see the house because we were buying off-plan but when we picked the kitchen, the bathroom, and the flooring we both felt that we'd made it our own. It was brilliant." "I fell in love with the kitchen in the show home so we actually picked the same one. It's very modern - white and dark grey. Our bathroom is a sandy colour - again quite modern - and there were loads of different samples you could pick from for the flooring. That was definitely a bonus for us." 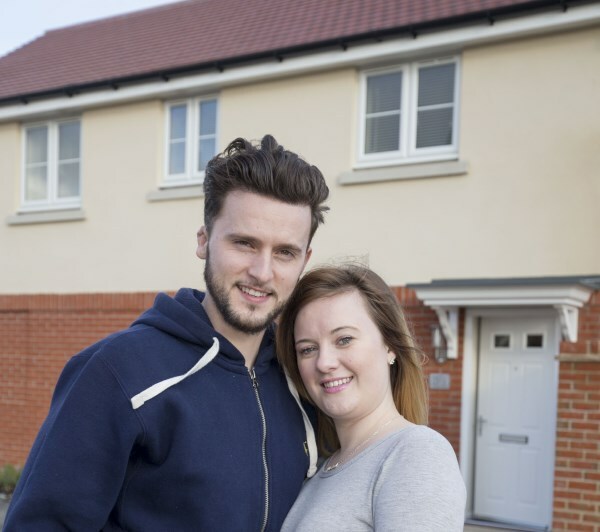 Kirsten, 24, and Daniel, 27, are delighted with their first home. It's 10 minutes away from Kirsten's work in a jeweller's in nearby Titchfield, and she is five minutes away from her family, which is just what she wanted. The location is also perfect for Daniel, whose work as a self-employed painter and decorator takes him all over the region. And having looked at so many houses before finding the right one, they are happy they picked a new-build. "It's really modern and that's what we were after; and the size of the rooms is brilliant," Kirsten says. "We'd been living with parents and then with my sister, so to just move into somewhere and just literally have to put your furniture in was just great. It is definitely the perfect first home for us."